Phuket, 3 December, 2018– The 32nd Phuket King’s Cup Regatta was off to a flying start on Monday with a strong breeze of up to 17 knots, allowing race organizers to hold two races in all classes off the southern part of the resort island. With one of its hulls completely out of the water as it cut through the sea at high speed, leaving everything in its wake, its only real rival was its handicap. However, despite being about to hit almost 40 knots in a strong breeze, the Scallywag crew had to settle for second place on Monday behind Australian Dan Fidock’s Fugazi in the Racing Multihull Class. Scallywag was first over the line by a country mile in both races on Monday, but Fugazi also sailed well and once the handicap was deducted from the big boat’s time, the smaller Aussie-helmed boat took the honors. 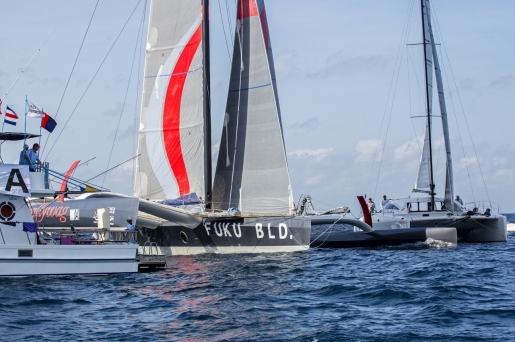 One of the biggest regatta fleets in Asia will take to the water again on Tuesday morning as the second day of racing gets underway in the Phuket King’s Cup, which finishes on Saturday.